1100 words / 6 min. Tweet Share What happened to federal common law in the nineteenth century? The common-law system of precedent, where higher court decisions are binding on lower courts, as opposed to the civil law system, where courts merely interpret statutes. Common laws or “the common law,” created by judges and not by statutes, that bind people equally as much as any statute. They are not passed by legislatures, and are instead considered to have emerged either as encapsulations of general behavior and morals, or as increasingly accurate representations of universal laws. These are ”long established local customs having the force of laws.” Swift v. Tyson, 41 U.S. 1, 18 (1842). 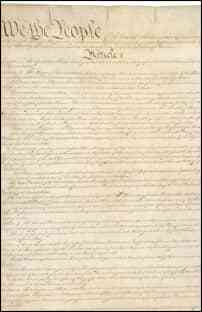 When the United States Constitution bound the states together in 1789, the common law (in sense #2) — inherited largely from England — was slowly but inexorably being replaced by statutory laws that often, but not always, codified earlier practices. In 1842, the Supreme Court wrote that court decisions “are, at most, only evidence of what the laws are; and are not of themselves laws.” Swift, 41 U.S. at 18. They continued, “The laws of a state are more usually understood to mean the rules and enactments promulgated by the legislative authority thereof, or long established local customs having the force of laws.” Id. Common law is this second understanding. While this second understanding of law has died out in its pure form, the common-law system of precedent, continues today and — despite being nowhere explicitly written into the Constitution (though it is arguably implicit) — continues to separate the American (and other English-derived) systems from the civil-law approaches of Europe and elsewhere. Also important to remember when discussing this issue is the federal system of the United States, in which federal power is defined within the Constitution, and all other unenumerated powers are — in the words of the 10th Amendment — ”reserved to the States respectively, or to the people.” Even as federal common law continued to be restricted, state common law remained unaffected by these federal Supreme Court decisions (though the trend was similar). The Supreme Court in United States v. Hudson & Goodwin, 11 U.S. 32, 34 (1812) took us down the path of restriction the first kind of common law (that of “local customs having the force of laws”) when it made it clear that there was no federal common law of crimes: “The legislative authority of the Union must first make an act a crime, affix a punishment to it, and declare the Court that shall have jurisdiction of the offence (sic)” (this is also known as nulla poena sine lege). Criminal prosecutions in federal courts required a federal statute — but no mention was made of civil (or commercial) law until Swift in 1842 (which found there was, indeed, a federal civil common law — a decision which remained until overturned in 1938). Note that the Court did not rule on the status of state common law in regards to crimes — this was a decisions left to the states themselves. Why was there no federal common law of crimes? The Court reasoned that the judicial branch is granted only limited powers by the Constitution, and that its only implied powers are contempt of court and the enforcement of court orders, since these are necessary to, and required for, the basic functioning of any court. Criminal laws, on the other had, require an explicit grant of power to courts: “all exercise of criminal jurisdiction in common law cases we are of opinion is not within their implied powers.” Hudson, 11 U.S. at 34. It is not immediately obvious to me why the same logic the Supreme Court used in Hudson would not apply to all federal common law, including commercial and other civil law matters, but nonetheless the Supreme Court did not hold this to be the case until Erie Railroad Co. v. Tompkins in 1938. Instead, likely driven by “the connection between legal rules and nineteenth-century economic growth,” the Supreme Court in Swift allowed federal district judges to develop federal common law independent of state decisions and laws (American Legal History, 163). Without this rule, Justice Story argues in Swift, the boom in interstate commerce made possible by the railroads and the telegraph could be dampened by uncertainties in the enforcement of commercial transactions. Arguably, the implied existence of a federal commercial common law — at least when transactions cross state boundaries — is in line with the Constitution’s grant of federal power over interstate commerce (the “Commerce Clause“) in a way that is not true of criminal matters (which are not mentioned in the Constitution as generally falling within the purview of the federal government). But the Court in Erie finally overruled Swift in 1938, and directly challenged this argument, holding that “no clause in the Constitution purports to confer such a power [to create substantive rules of common law] upon the federal courts.” Erie, 304 U.S. at 78. Federal common law was thus dead — except in admiralty and international contexts (more on these another time). Still, it remains, in the words of Justice Marshall, ”the province and duty of the Judicial Department to say what the law is.”Marbury v. Madison, 5 US 137 (1803).